Higher, higher, higher. Yes, you got it! 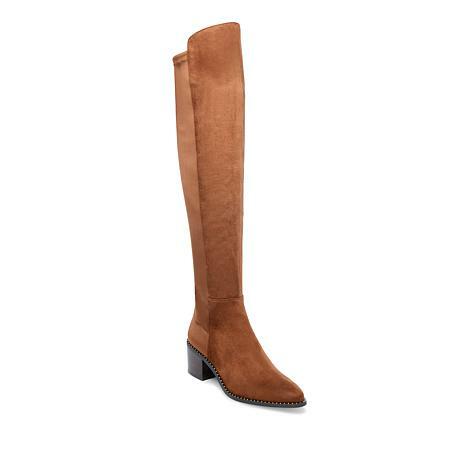 Ankle boots have their place in your wardrobe, but these knee-high boots are for the seriously chic fashionista. Think you can't pull them off? Think again! Over skinny jeans, under a flowy maxi dress or paired with a micro mini (if you dare), these luxe West boots from Steve Madden are a cold-weather wardrobe must-have for women of all shapes, sizes and age. Love these! Confortable and soft. A little higher over the knee would be ideal. I wish they weren't mixed media 'cuz I don't need the extra stretch around the calf, and the suede looks and feels better than the other fabric. The heel height is good. As far as sizing, just to give you an idea, I'm 33 and 115 lbs, and I have narrow feet (size 8). They fit ME perfectly true to size. However, my mom, who also wears size 8, can't put them on. If you have searched for a tall boot and could not find something, I tell you this is the one. 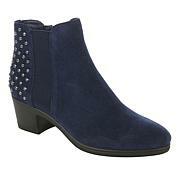 The studs convey a certain interest without being too much and the material is comfortable for this tall pattern. Great; With wear it will expand slightly. 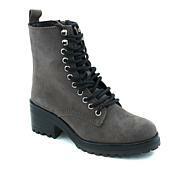 I have heavy tighs , so tigh high boots have not been for me until now. These are flattering and comfortable. They dont cut into my legs and they stay over my knee. So pleased that I brought them. Love these boots. I'm 6' tall so the length is perfect. The little studs around the bottom are just enough to add a little interest. Unfortunately I have to send them back since they are too narrow. I ordered the wide and never wear a wide and they were still too narrow. 5 stars for the style. Remind me about Steve Madden upcoming shows. Take a hike! It doesn't matter if you're a fan of the great outdoors, these classically chunky boots are your must-have item for the season. 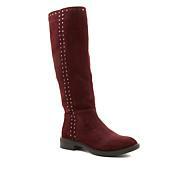 Wear this comfy pair with leggings, a plain tee and a plaid shirt or tights, a corduroy skirt and a sweater.